A clean and properly adjusted Briggs and Stratton Carburetor helps your small engine run safely. Jack’s carries a wide variety of replacement Briggs and Stratton Carburetor parts, Briggs & Stratton Carburetor kits and more parts to help make your small engine carburetor repair as quick and easy as possible. Whether it’s a welch plug, nozzle, primer blub, or a complete rebuild kit for your Briggs & Stratton carburetor, trust Jack’s to have what you need. 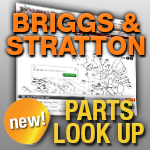 Choose the category below that best fits your Briggs & Stratton Carburetor repair needs.